" since I was in college, that is approximately twenty years ago and not used any more. This half cool and half not cool slang reminds me of the art of Bruce Conkle in the sense that it is cool in a comfortably not cool way. Besides that his art evolves to a certain extent about the meaning of this sentence, which is of course drawn from english language "to make a difference". To matter, to change something, is the goal of Bruce Conkle and even though he puts his art forward in some kind of a humor he is very political in his position. In the Living Art Museum Bruce Conkle shows aluminum clouds, but the phenomenon aluminum clouds can also point to nuclear clouds and at the same time some kind of doomsday. His aluminum clouds are also like a carousel, they turn cheerfully in circles in black irony which also calls forward the biggest political quarrel here in Iceland in the last few years. 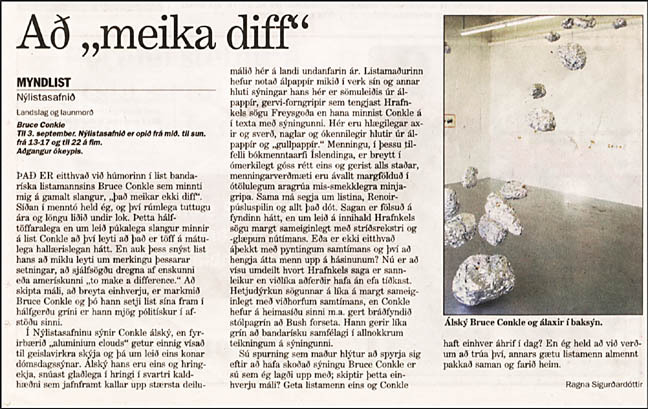 The artist has used aluminum foil a lot in his art lately and another part of his exhibition here is also from aluminum foil- fake artifacts which are connected to Hrafnkel's saga Freysgoða but Conkle mentions it in his text accompanying the exhibition. Here are laughable axes and swords, nails and unidentified objects made from aluminum foil and gold foil. Culture, in this instance the literary cultural history of Iceland, is changed into worthless trinkets just like happens everywhere where cultural history is multiplied in uncountable variously tasteless tourist junk. The same can be said about art, Renoir puzzles. The history is faked in a humorous way but at the same time the story of Hrafnkel´s saga has a lot in common with today's warfare and war crimes. Or is there not something similar with modern torture and hanging people up by their Achilles' tendons? It is actually controversial whether Hrafnkel´s saga actually happened but such methods described in the story probably existed anyway. The hero worship of Hrafnkel´s saga also has a lot in common with today's views, also Conkle has in the past for instance made fun of president Bush. He also makes fun of American society in a few drawings in this exhibition. The question that you must ask yourself after seeing Bruce Conkle's exhibition is the one that I began with: Does this matter at all? Can artists like Conkle have any influence today? I think we have to believe that it makes a difference or all artists could pretty much pack up and go home.